What kind of example are you setting for others? 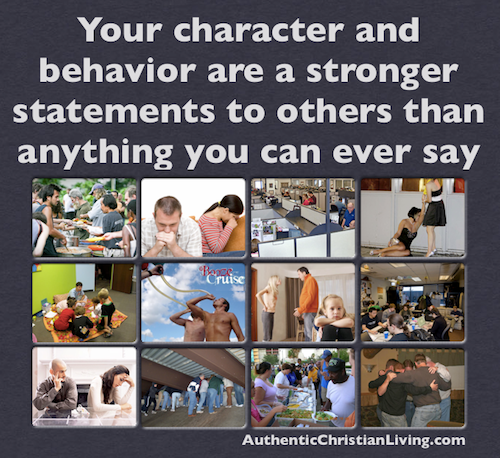 Do your actions prove out what you say you believe? a child, a friend or even the person behind us in traffic. Someone in your life looks up to you and is watching your example. Please do not consider this a call to be perfect, for we all fall short of our potential. However, if we realize the unlimited crazy love that God has for us, that joy will fill us and we will want to grow closer to our Father and to please him. For me personally, I find that having close friends that feel comfortable confronting me (in love and with my best interests in mind) helps greatly. They are there to support in good times and in bad. It takes time to seek out and develop these relationships with other believers – take the first step today.